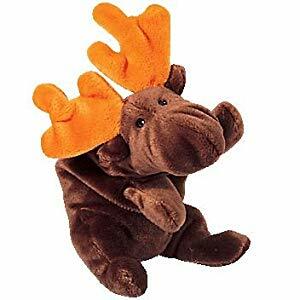 Chocolate is a dark brown coloured moose with black button eyes and bright orange antlers. Can you guess his favourite sweet? Chocolate is one of the original nine Beanie Babies released 8th January 1994. The first generation of swing tags didn’t include a poem and it wasn’t until Chocolate was released with a 4th generation swing tag did he have a charming poem to his name. Chocolate has been released with five different generations of swing tag and six generations of tush tag. Chocolate’s birthday is on 27th April 1993. He was the last of the original nine to retire on 31st December 1998. A McDonald’s Teenie Beanie version of Chocolate was released in 1997 and a Beanie Buddy in 2000.